Manager Tony La Russa during Game Three of the MLB World Series against the Texas Rangers on October 22, 2011. (CNN) - Why doesn’t a winner smile. That’s the first thing we wanted to know when we spoke with the third winningest manager in baseball history, Tony La Russa. We tried to find a picture of him smiling during all those winning years and couldn’t. He’ll tell us why in this edition of CNN Profiles. La Russa will also help us baseball novices understand the game better – especially the part of the game that even diehard fans dismiss as boring. That time between pitches when it seems nothing’s going on. Wait until you hear what’s going on between pitches with something as simple as a man on first and a big game on the line. And then there’s that space between the player’s ears. The psychology of the game. The resilience required when losing and striking out is such a regular part of the game. 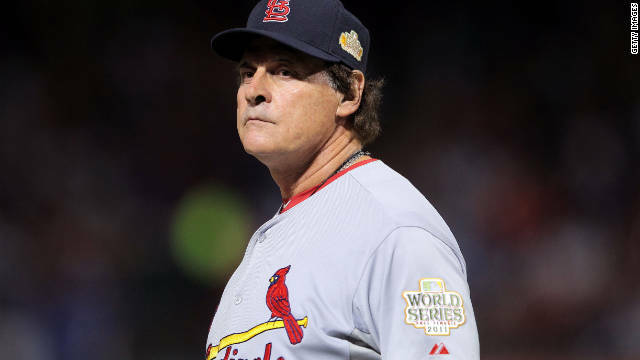 La Russa retired last year after he led his St. Louis Cardinals, who barely made the playoffs, all the way to a World Series championship. He walks us through the huge load of information managers and coaches and players have to process to make the most of every single play. And we ask him – of all the players on the field – who has to be the smartest of them all? Listen to Tony La Russa, author of the new book "One Last Strike," and you’ll have an edge understanding what you and your friends are watching as we head to the 2012 World Series. Those rumors of him smiling are false. I just googled "Tony La Russa smiling" and found numerous pictures of him smiling. The author must not have looked that hard. I've seen Tony smile. But it was off field. Just about every week when he was coaching the A's, he would bring his wife, two daughters and his parents into our restaurant for Chicago Style pizza. There, he would smile....away from what he probably knew in his heart was the declining morals of the game. Coaching two dumba$$es like Jose Canseco and Mark McGuire....all juicing up for everyone to see. Probably because he was at a ball game. The most boring sport in the world. If you think baseball is so boring, why are you reading an article about it and making dumb comments? In order to say that baseball is the most boring sport there is, that's why. Baseball is a thinking man's sport ... and that's where you, Jim, get left behind. Baseball is only boring to the uninformed or willfully ignorant. Which are you? Baseball is the perfect game, blending strategy, suspense, and action as no other. There is no clock or other artificial constraint on play, instead each game develops its own tempo and you keep playing until one team wins. Its the ultimate combination of coordinated team performance (while in the field) and individual performance (while standing in the box facing the pitcher). Baseball demands mental involvement and physical performance like no other sport. Football actually has less action than baseball. Basketball and soccer are a farce. There is no hockey yet (and there may not be a season). Ahhh, October and baseball is in the air. Perfect. You lost me after your first condescending sentence. What an a$$. I'm not in the least bit surprised you got lost. I understand that Baseball has no appeal to those with a short attention span. Couldn't agree more with Tex... and Go Rangers! Texas will not beat the O's tonight. Texas is not half as scary as they were lat season. The only hope they have tonight is that Darvish is on the mound. Unfortunately for you, the rest of the playoffs won't be one game series where you can pitch the only good pitcher you have. Maybe Nolan Ryan will suit up...LOL....As good as Baltimore has been playing lately, and as average as Texas has been, the O's should be able to win tonight w/ no problem. No question that the two most-exciting stories in the AL this season have been the success of the O's and of the A's. Rangers are pretty beatup, as are the O's. My Rangers of late have looked as if they've been playing not to loose, as opposed to playing to win, but haven't been doing so with any success. Hoping for a good game tonight – and that the winner puts it to the yanks. I love the historical aspect of the baseball. The modern game just doesn't do it for me. The pace is ridiculously slow, great for chit-chat and beer drinking I suppose. Have you ever watched a three (3) day long Cricket game? Now that is boring! Joe Torre won four World Series for the New York Yankees lost two and he got fired because it appeared that the franchise wanted him to win a World Series every year. Terry Francona reversed the Curse of the bambino, winning two World Series for my Boston Red Sox and thee franchised fired him to hire a looser Bobby Valentine, causing the team to finish last with the worst record since 1965. My message to the Boston Red Sox...please bring back Terry Francona. Please. Terry Francona is too intelligent to get talked into going back into that mess. The Sox will be a last place team for a few more seasons. Get your tissues ready Sox fans. Like Yogi Berra said....It's deja vu all over again. The only thing better than being a Yankee fan is watching the Sox fall apart at the seams. I LOVE IT!!!! You can find all kinds of pictures of Tony smiling. Just not very many during the game. He may have a bit of smirk when talking/listening to someone, but usually he was so intense & involved with the game, he didn't have time to smile. And he would probably tell you that until you win there is no reason to smile. Thanks for the last post season, Tony. It was a lot of fun. LaRussa was the manager responsible for 2 of the biggest doping teams in history. The Oakland A's and the St. Louis Cardinals. Say what you will, the Cards were riddled with PEDS. He doesn't deserve the accolades. Without PEDS he would have been an average manager at best, and probably not even that. Every team they played were doped up too. 2006 WS they beat alleged dopers Pudge and Magglio Ordonez, They lost NLCS 2005 to Clemens and Pettite. Lost WS 2004 to Manny Ramirez. Lost NLCS 2002 to Barry Bonds. I love how CNN writers have this habit of asking questions for their tag line yet never bother to answer them in the story. Also, that very first sentence probably needs a question mark since it appears to be a question. Finally, Google, USE IT. It seems like most times when CNN writers have questions that they make out to be some big mystery the answer, or in this case picture, is easily found after spending a mere 15 seconds doing a Google search. Wow....I definitely saw him smile when we won last season. And he had the biggest smile at the parade too. http://metsmerizedonline.com/wp-content/uploads/2012/01/Smile.jpg Not that hard to google for a "laroussa cardinals smiling"
I did the same thing and found one right away. I guess telling the truth doesn't apply to even these fluff stories. Stupid CNN. That was a great interview! I wish it went on for a couple of hours. Thank you Michael Schulder. Google images yields several photos of him smiling.